AmEx and Costco's 16-year deal is now coming to an end. One out of every 10 AmEx cards is a Costco card. The move has resulted in the largest one-day decline for AmEx since 2011 (-6.4%). AmEx was unable to reach a new agreement with the wholesale club that made sense for the card issuer. The unusual partnership, in which Costco exclusively accepted AmEx cards, had driven a significant chunk of business to the New York card company. In addition, AmEx and Costco issued a credit card together that could also be used at other merchants. When the arrangement ends next year, millions of customers will be forced to use a different credit card when shopping at the wholesale store. 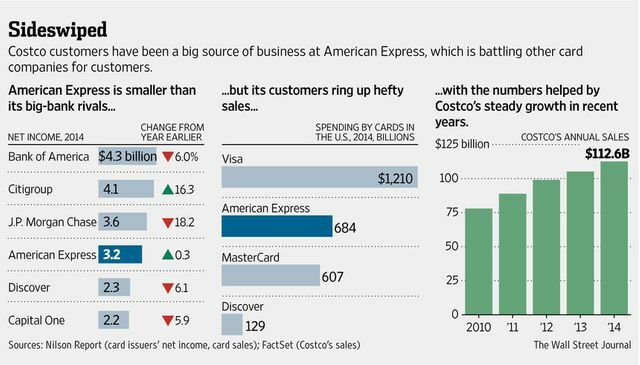 American Express and Costco are ending their 16-year relationship, a surprise move that pummeled AmEx’s stock price and will trigger a major upheaval in the card industry. Robin Sidel joins MoneyBeat. Photo: Getty. The failure to agree on new terms was a fresh blow to AmEx, which was already falling short of some sales targets.